THE NATIONAL CIVIL Aviation Threat and Risk Group is set to meet to discuss potential drone activity near Irish airports. Minister for Transport Shane Ross called the meeting for tomorrow following recent incidents of possible drone activity at London’s Gatwick and Heathrow airports. Departures from the Heathrow were suspended for around an hour yesterday evening following a suspected drone sighting at the airport. There was also major disruption at Gatwick days before Christmas, when a suspected drone sighting stopped flights into and out of the airport. 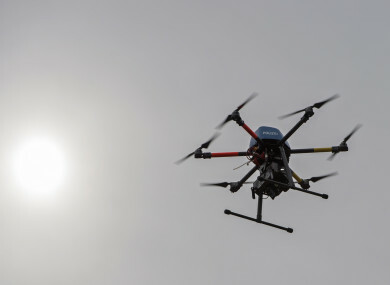 The group is set to assess whether any steps should be taken to improve the response to potential drone activity around Irish airports in future. An exclusion area of 5km around already exists around Irish airports, and Ross said the misuse of drones – particularly flying them in Irish airspace or within the exclusion zone – was “a very serious matter”. “I have asked my Department to convene at short notice a special meeting of an expert industry group to assess recent events and advise me on how we are prepared at our own airports and whether there are further things which can be done,” he said. However the Minister added that the likelihood of a drone attack in Ireland was “low”. Email “Special meeting of 'risk group' to assess threat of drone use near Irish airports”. Feedback on “Special meeting of 'risk group' to assess threat of drone use near Irish airports”.